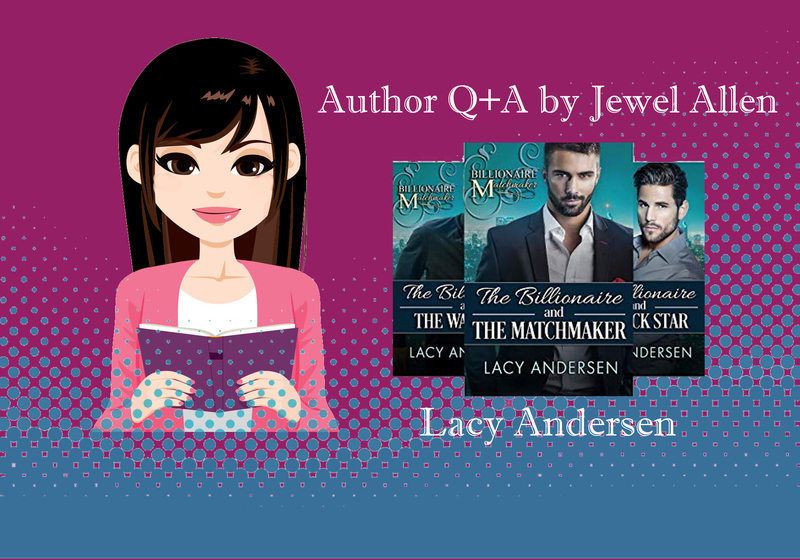 Author Lacy Andersen isn’t a billionaire in disguise, an ancient vampire in line for the crown, or a rock star looking for love – but she does love to write about them. A graduate of the University of Nebraska at Omaha with a MFA in writing, she currently lives in South Dakota with her loving husband, two precious kids, and two furry pups. Supplying happily-ever-afters is her passion. She is the author of several series, including the Billionaire Matchmaker series and the Monstrana Paranormal Romance series. Today, she’ll share about writing to market, what has helped her write faster, and how she balances her writing time with family. Q. Can you tell me how you got started writing? A. I think it’s the same old story with a lot of us writers. I started writing stories when I was in elementary school on my parents’ old computer. I particularly remember a story about a girl who jumps into a fantasy land and meets a cute boy and a unicorn. I wish I could find it today, haha… But I went on to major in English in college and then got a Master of Fine Arts in Writing. Q. What did you hope to do by getting a Master of Fine Arts? A. At the time, I thought that was the way I had to go to get published. And I was interested in the possibility of teaching at a university someday. It put me in a lot of debt, but I learned a ton and made great friends, so I can’t say it wasn’t worth it. Q. One of the things that intrigued me about you as an author is the fact that you write about billionaires, vampires, and rock stars. Can you tell me which came first and why? Q. Your paranormal romance series sounds cute. On a scale of 1-10, with 1 being least, how “scary” would you say your Monstrana books are? Or is it more tongue-in-cheek? A. Maybe a 2? These paranormal creatures are a lot like you and me, except with a few more added complications of burning in the sun and getting hairy under a full moon. They’re full of humor, sass, and undying heart. 😀 My critique partners even said that I converted them into paranormal readers through this series, so I think they’re pretty tame. Q. Nice! I think it takes talent to be able to write funny. What do you do so you can get in that funny place? Any advice for authors who want to put humor in their fiction? A. Oh, that’s a tough one! I wouldn’t call myself overtly funny. I write kind of tongue-in-cheek humor. I try to put my characters into ridiculous situations or think of the most awkward thing they could say at that time to ruin the moment. I’m a little awkward in real life sometimes, so it comes naturally haha. But as for advice, I would just say that in my opinion, the best humor comes at unexpected times. During the middle of a serious moment or a romantic outing. It’s fun to surprise the reader and I think my fans like that. Q. Ha ha, that makes sense. I can see, looking at how you spaced out your books–for example, your billionaire series–that you rapid released them. Can you tell me how frequently you are publishing, and how far ahead you write your books? A. I rapid released my paranormal Monstrana Romances and my Billionaire Matchmaker books (each consisted of three books). I probably took about a month to write each and released as soon as the third was on its way to the proofreader. I wanted the rush that comes with a super fast release date since I didn’t already have a built-in audience for those genres. Now, I’m slowing down. I’d like to release one a month, starting in April with my next contemporary romance. Q. Smart! What has helped you become a faster writer? A. Getting out of my own head and just barreling through the tough spots. A mentor in my grad program gave me a book – Immediate Fiction by Jerry Cleaver – and in it he talks about an author who analyzed his writing on the brilliant days vs. stinky days. He realized that they really weren’t much different in quality. It was all mental. So, I try to remind myself of that when I’m in a tough spot. Just keep writing. Once it’s on the page, I can revise or change it. By the way, I highly recommend that book! It’s my favorite craft book. Q. Thanks! I’ll have to check that out. What year did you publish your first book? A. I think it was 2016. But that’s a book that shall forever remain in the depths of my computer now. It was a Nicholas Sparks style book and I’ve learned a lot more about what the readers want since then. Q. Fair enough. Now that you have written in several genres, which genre have you found to be the most lucrative? Have you noticed any market trends in, say, the past year or two? A. Without a doubt – contemporary romance. And of course, the trend I would point to the most is how clean and wholesome has become so popular. When I first came on the indie scene, I don’t believe it was really a thing. Q. I know… that is fun, isn’t it? I remember reading somewhere that you planned on quitting your day job so you could write full-time? Is that right? A. I quit my full-time job when I had my first kiddo three years ago. It was a sort of combo deal – stay home with our child and work on my dream of earning a living with my writing. It’s been a long journey. I’d love to replace that income someday. The good news is that from what I’ve seen from other “clean” authors is that it’s very possible. But this past January I earned more than I have ever earned in a month, so I’m making progress. I had to learn the hard way about writing to market. I’m a little stubborn sometimes about doing things all the wrong ways before I stumble on the “correct” way haha. “Correct way” meaning in this case, the best way to actually sell my books to a large and hungry market. Q. Can you tell me what your best month’s net earnings have been? A. I made over a $1,000 in January. That’s my best month to-date. Q. Cool. Let’s back up a minute. I guess I was curious to see which sells best nowadays: billionaires, vampires, or rockstars? Or something else from your backlist? A. Despite the fact that there are a bazillion billionaire books out there now, that’s my best seller. But vampires are timeless as well, so I think if I market it correctly, they’ll sell for a long time. Q. Vampires are timeless. Good one. What has been your favorite type of book to write so far? A. I don’t know that I could pick! I love them all in their own ways. Q. Safe answer. LOL Have you done any paid marketing and advertising? What has worked well? Not so well? Even non-paid, I guess? A. I’ll admit that I haven’t ventured much into the marketing yet. I’ve played around with some Facebook ads, some Amazon ads, and booked a couple small newsletters. ENT would probably be the best one I’ve used as of yet. I need to take the time to take a course on utilizing ads, but I’ve been focused lately on just getting a good backlist set up first. But as for unpaid ads – I’ve really come to appreciate the power of newsletter swaps with other authors in your genre. I set up about 30 for my first billionaire book and it helped keep my rank sticky for a long while. Q. Yeah, NLs can be great. Our time is almost up, so I have just a couple more questions. As the mom of a young family, how do you balance writing/publishing with other demands on your time? A. Great question! It is a daily struggle. I won’t lie, oftentimes household chores will suffer because I’m writing on a deadline. But my husband doesn’t mind. He supports my dreams and knows that this will all pay off eventually. But my strategy is to try and write during nap times (not so easy with a fussy infant right now) and when I’m really in a pinch, as soon as my hubby gets home I seclude myself in my bedroom and pound out a chapter. We also try to live a more minimalistic lifestyle. It helps keep things manageable. Less dishes to wash, less clothes to wash, less toys to pick up. More time to write. Q. That is great. That’s all the questions I had for you today. I really appreciate your taking the time to chat with me. Do you have any parting advice for authors who want to level up their publishing career? A. My parting advice would be to not travel this road alone. There are so many authors who have found success and have detailed their methods on wonderful blogs (like your blog!) or on Facebook. The path has already been paved. Figure out how to utilize their methods, write to market, and write what you love. And always be kind. These people are your partners, not your competition. Q. Thanks so much! I love your philosophy. A. Thank you! It was so much fun! Learn more about Lacy Andersen’s books on her Amazon page or visit her Facebook page. To learn more about how to write & publish a profitable series, check out my book Rapid Release.